Spring Framework is an open source application framework for the Java platform, mainly for Enterprise Development(J2EE). 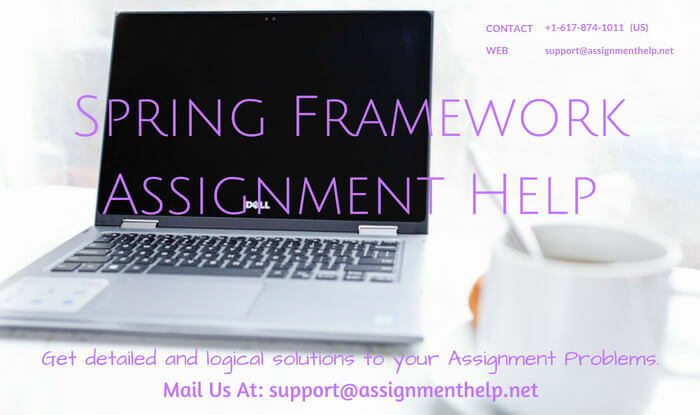 Assignmenthelp.net provides excellent online help services in J2EE project with Spring Framework for students of all grades. We have online Expert tutors and professionals in the area, available to help you in Spring assignment, 24/7 live. Get the cost effective solutions of your Project, homework and assignment in time only at assignmenthelp.net. If you are looking for any kind of Spring related help Servlets, Struts, Hibernate, Eclipse projects, Java Programming etc. then you are at the right place. You may belong to any grade, we provide assignment help service from basic to high level coding. you should try our programming service. We do all kind of programming work starting from basic programming to high end application programming. We also provide Spring Framework programming, Spring MVC Web, JSP Web programming, JSP Project to university students. For school students our service is also open. Try our assignment service Now, solution of your problem is just a click away. Ping any time at our 24x7 live support Live chat for any query. To know about how to proceed, just visit How it Works page at Assignmenthelp.net.